Crucial Conversations – Adventures in Networking! FINALLY a book about real life situations. I can name you a dozen titles recommended to me. Great bedtime reading. Most are useless you are a CEO. 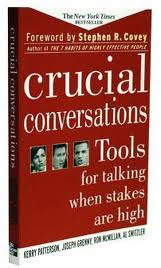 But this book is all about (don’t be fooled by the “stakes are high” phrase in the title) those every-day critical conversations that affect your day, week, month, job, life and relationships at work and home. I’m talking hallway talk, return from weekend talk, start of the meeting talk, walking to elevator talk, ambushed by boss talk, ambushed by spouse coming in the door talk – Wow it was short and powerful. A surprisingly quick read with razor sharp concepts you can understand. Are you being pushed at the office/home from the top, the sides and from below? Read this book sooooon! A powerful weapon for peace at work and home. Only problem, after reading this book I put every title by the authors on hold at the library. Each one is a “must read” and I refer them weekly. Seems each of these titles are on the reading lists of over 60% of my network. Let me know if you want the titles. Until then, enjoy these helpful tips from the authors..